Blazon: Argent sem閑 of Tudor roses, three lions passant gardant in pale azure. The English Football Association's flag was spotted on the Association's web page and flying outside its headquarters at 16 Lancaster Gate, London, W2 3LW. The flag is a plain white field with the traditional English Three Lions (King Richard's) and nine red-white roses (of the Lancaster-York peace in the XVth Century). This is the FA's, as well as the English national team's, badge. This "three-lions-on-a-shirt" badge dates from the late XIXth Century English team international caps. Those caps, awarded to football players on becoming 'international', where at first intended to have been white (of white silk, indeed) with a red rose embroidered in the front (plain white jersey and trunks were the English team uniform up to the 1970s). Nonetheless, the original caps were made out of navy blue velvet with a red rose, which was subsequently substituted by King Richard's three lions. The FA's headquarters are no longer located on Lancaster Gate, but on Soho Square. I have seen this flag and I think the shade of blue should be darker than that depicted above. See the current edition of the FA web site, for comparison. This also features a badge with ten and not nine red roses. I found some photos with longer lions on flag. I also found white and red flags with the full logo. I'm not quite sure but white flag may be used by the FA on stadiums and the red one by supporters. The Premier League. 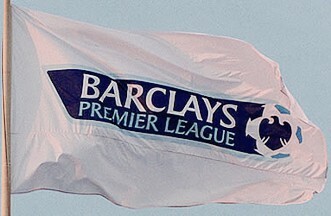 Barclays was the most recent title sponsor, having sponsored the Premier League from 2001 through 2016 (called Barclaycard (FA Barclaycard Premiership) from 2001�04 and Barclays (Barclays Premier League) 2004�16, although it was called FA Barclays Premiership until 2007). We have attempted to show only official team flags - i.e. those flying at official poles on the stadium, or at the team's headquarters. There are a lot of fan flags, but very few "official" flags. Football teams "flag-rugs": Having checked with my source of all info regarding English football, the former President of the Everton Supporters Club, he informs me that for the past three or four years it has become the custom for those suppliers catering to various football supporters to issue throw rugs in the form of club flags. He does not know if they are officially sanctioned by the clubs themselves, but as he bought an Everton flag/rug at the Everton Club Shop he assumes that in that case at least he must assume that at least the club knows about it and has no objection to their flag being used in this manner. The arms or logos of many of the teams can be found on the BBC website, listed according to their leagues in 2005: Premier League, Division 1, Division 2, Division 3. Birmingham City FC does not have a flag; however, the team logo is widely displayed on the usual variety of souvenir items. It consists of a globe over a football, with a blue ribbon entwined around the two spheres, the whole being on a white background. On the ribbon are the words 'BIRMINGHAM CITY/FOOTBALL CLUB' and the date of its founding. The basic colors of the logo are blue and white, the globe and the football being outlined in that color with a white background, and the ribbon being a medium blue with the text in white block letters. There seems to be a wide variation in the shades of blue used on souvenirs etc, and there are even one or two items with the colors reversed. There does not appear to be an actual flag for Bolton Wanderers FC, which is located in the old mill town of Bolton, about ten miles from Manchester. There are several versions of the team logo, all in different color schemes, but the basic design remains roughly the same. A typical representative of these different varieties of Bolton crests can be found at http://www.krysstal.com/club_bolton.html. Bournemouth FC uses a very stylish logo which forms the centerpiece of the unofficial flag used by the club's supporters. It is clearly the the product of a skilled designer and graphic artist, and is one of the more striking club logos/flags I have yet seen. The basic element is a knightly shield, sloping at the sides and tapering to a point at the base, and a horizontal top, whose line is broken by a football in black and white partially protruding above it. The central image is a stylized representation of a football player (or, again to use the British term, a footballer), seen in left profile. The top of his head is in contact with the base of the football, which causes it to protrude above the top of the shield, referred to above. The footballer has his face tipped toward the upper left, and he is shown in white with his hair defined by minute black crosshatchings. To the left of the shield the background color is red, while to the right (and separated by the football) the background consists of vertical red and white stripes. For the unofficial supporters' flags this image is usually centered on a white rectangle, although I have seen examples where the rectangle is bordered on all sides by a thin red line. The logo for this club can be found at http://www.ealing-web.com/brentfdfc.jpg. In recent years, until the county was entirely subsumed into Greater London, Brentford served as the County Town of the County of Middlesex, and this is reflected on the club logo. The club logo also appears as a centerpiece on the flags of its supporters; as usual in these cases this flag is simply a logo on a white bed field. The logo consists of a shield quartered, with a concave top, vertical sides, and a rounded bottom tapering to a point. Across the entire width of the shield at the top and extending in a bias diagonally from lower left to upper right, with each end scrolled around the outside of the shield, is a black ribbon. Across the face of this ribbon, also written on the bias, is the word 'BRENTFORD' in large white block letters in an italic script. As noted, the flag is quartered; this however seem to have exhausted the heraldic inventiveness and creativity of the logo's designer. The upper left quarter consists of alternating red and white vertical stripes, four apiece. At the bottom of this quarter and written in two lines of black upper and lower case italic script are the word and date 'Founded 1889'. The upper right quarter depicts two bees with black and yellow bodies and blue wings buzzing around the top of what appears to be the base of a tower with an arched entrance (possibly a beehive). The tower itself is red with white mortaring and rests on a white background. The bees presumably refer to the team nickname. The lower left quarter consists of the traditional arms of the County of Middlesex, viz, on a field gules three swords argent with gold hilts to the fly arranged one above the other, with a crown or above them. The lower right quarter is simply black with the words 'Football Club' in two lines of italic upper and lower case italic script. Brighton and Hove Albion FC does not seem to have a flag, but it rejoices in three separate logos, two of them identical except for color. The team is commonly known as 'The Seagulls', and the eponymous bird appears on all three logos. The logos show a gull in flight with wings extended on either a vermillion http://www.krysstal.com/club_brighton.html or a deep blue background http://www.worldfootball.org/logo.php/country/ENG/club/1000000022. In both cases the central image is surrounded by an outer ring giving the name of the club. There is also a dark blue badge showing the gull but with the club name abbreviated in block white capital lettering separated by full stops (periods); this badge is also to be seen on the World Football web site as given above. I have not discovered any mention of any club flag, formal or informal, but I shouldn't be surprised if there were some floating around. The clearest image of the Bristol City FC coat of arms can be found at http://www.krysstal.com/images/club_bristolcity.gif. These arms consist of a red shield with a silver sailing vessel lined in black sailing from right to left. This vessel has a two-towered castle-like structure amidships, also in silver and black; atop the two foremasts of the vessel as well as on the two towers of the castle, silver flags are flying. At the lower left of the shield is a symbolic representation of the River Severn in light blue, crossed by two wavy black lines, while to the lower right is a light green cliff. Beneath the shield is a silver ribbon furled at each end, and with the word 'BRISTOL' in black block lettering on the left-hand section of the ribbon, the date '1897' also in black on the small central section, and the words 'CITY F C' likewise written in black block lettering on the right-hand section. Standing as supporters to the right and left are two golden unicorns with silver horns, while above the shield is a knight's casque in silver with black lines. Atop the casque is an intertwined device in dull green and gold, with a set of scales in black suspended from the gold portion. Alternate versions of these arms can be found at the Bristol and West Building Society and Bristol City Academy web sites. The B&W version has the club coat of arms in a much reduced format, with the initials 'BCFC' written in red block letters beneath it. The entire image is on a shield with a white background and bordered black, all on a red field. The City Academy version is virtually identical to the B&W one, except that there is no red field. Telephone conversations with the BC public relations office have revealed that the supporters' flag simply containing the large version of the club coat of arms is the most official of the unofficial versions, in that it has been displayed in the Chairman's office, the Directors' Meeting Room, and a few other places, although the club has never actually gotten around to make this version fully official; I forgot to ask whether this flag is currently displayed anywhere on the club premises. The flags most commonly seen at matches, the PR wallah told me, were the ones with the club logo (as opposed to simply the club arms) on the red field, as seen on the B&W web site; apparently these have been given away regularly at various local branches of the building society or else were sold with proceeds made available to charity. Finally, I was told that in recent years the club logo on a white field has been seen as well. The arms of the Club are the arms of the City, with the exception of the motto. The arms at the krysstal site are a simplified version of the city coat or arms at, for example, http://en.wikipedia.org/wiki/Image:Bristolarms.PNG. The Burnley FC, known as the Clarets, have a very beautiful heraldic achievement of arms which can be seen at http://www.krysstal.com/club_burnley.html. I have been unable to find any information as to whether the club uses a Banner of Arms for either a formal or an informal flag, so on present evidence the club has no flag. Charlton Athletic is one of the lesser known London sides in the Premiership. I have been unable to find an actual flag for the club, although my source on all matters related to English football tells me that he has seen Charlton supporters waving flags of different colors with the team logo or crest in the center. This crest is very striking and modernistic, and can be found on the Web at http://www.krysstal.com/club_charlton.html. The Coventry City FC Supporters Trust website shows a flag now being used at home games - a pale blue ("sky blue") flag with arms centered, and SKY BLUE ARMY written above and PLAY UP SKY BLUES in blue below. Crewe Alexandra FC has neither a flag nor a particularly interesting logo. For the record, its colors are red and white. Derby County Football club uses an informal flag in the form of a logo on a plain field. In the center of a white rectangle is the club logo, which consists of the outline of a stylized ram in dark brown with a golden horn. This is merely an extension of the club logo per se, which can be found at http://www.krysstal.com/club_derby.html. When I contacted the PR Office of Doncaster Rovers to inquire about a possible flag, I was referred to the manager of the club shop. He informed me that he had never heard of an actual flag, but that he sold a large variety of items such as white t-shirts, anoraks, trainer tops, baseball caps, etc, with the club logo. The logo is quite unusual, and shows the left profile of a man wearing a winged helmet, with a gold cloak spread out over his shoulder and chest. The club crest appears in the shape of a brooch; it is a standard shield divided horizontally white and red, with the white Yorkshire Rose in the center of the bar and the initials 'D.R.F.C' beneath. I am not sure who or what the helmeted figure is supposed to represent. The manager also mentioned that during WWII many of the Polish military and RAF personnel stationed in the area became keen 'Donnies' supporters because of the team's crest, although the design antedated the war by several decades; since the fall of the Communist regime in that country several DR supporters clubs have been established in Poland. The logo can be seen at http://www.footballhotels.co.uk/images/doncaster.gif. Hartlepool United FC takes its name from the fact that it actually represents both Hartlepool and its neighboring Urban District of West Hartlepool (although I understand that since 1974 both former Urban Districts have since been subsumed into one Borough named Hartlepool). The area was a major shipbuilding and maritime center for much of the 19th and and 20th Centuries, and this is reflected in the team logo, which is the basis of the supporters' unofficial flag. The logo consists of a 12-spoked red ship's wheel, with a black and white football at the hub. Above the device are the words 'HARTLEPOOL UNITED/FOOTBALL CLUB' in two dark blue lines, and beneath the wheel is the motto "The Town's Club" also in dark blue on a white ribbon. The supporters' flag consists of this logo centered in the middle of a white rectangle. The logo itself is visible at http://www.nutrocker.co.uk/images/60x60/soccer60x60/hartlepool_united.jpg. Huddersfield Town FC has a variety of logos, of which only two will be given in detail here. A modern variation based on the shield of the traditional heraldic logo (q.v.) can be found at http://www.krysstal.com/images/club_huddersfield.gif. This is a double ringed circular seal with white as the background color for the outer ring. At the top of this outer ring are three large gold five-pointed stars, and the words 'HUDDERSFIELD TOWN' in thin stylized black block letters at the bottom. The central image consists of six white and five blue pales at the top, with a white bordure beneath them. In the center is an upward-pointing chevron, also with a white border at the bottom and with a white Yorkshire Rose at the apex of the chevron; a blue five pointed star is at the center of this rose. The bottom of the central image is a gold field on which a black drawing of a Yorkshire terrier can be found at the very bottom. The dog has his right paw over a brown football. A much more elaborate logo can be found at http://www.gwgame.net/lotts/HUDFC.jpg. Most of the elements in the former logo have been redrawn, but I have been unable to ascertain which is the older, although my guess is that this version is. The number of pales has been reduced to five blue and four white, and the border beneath them has been narrowed in size although still white. The chevron no longer has a border between it and the bottom portion of the crest, and it now has two white Yorkshire Roses without stars, one in each bend of the chevron. At the bottom the background color has been changed to gold, and the Yorkie has been removed from his place at the bottom to be replaced by a ruined tower in white and black. The crest is now mantled in blue and white, with a knight's casque in white with a red visor and epaulettes and a blue and white cord wound around the top. Atop this casque sits our friend the Yorkie, now in the same background color as the lower part of the crest. Curling around the base of the crest is a pale blue ribbon with the words 'HUDDERSFIELD TOWN AFC' written in white block letters. The entire achievement of arms is placed on an irregularly shaped dark blue mound. If these two versions weren't enough, additional redrawings of the Huddersfield logo can be found at http://www.bbc.co.uk/northyorkshire/sport/images/football_logos/huddersfield.gif, http://www.nitrocker.co.uk/images/60x60/soccer60X60/huddersfield_town.jpg, http://www.napit.co.uk/viewus/infobank/football/engdiv2/huddersfield.gif, and finally http://www.zerozero.pt/img/logos/equipas/2583_simbolo.gif. Given this plethora of logos, one would logically expect that at least one of them would be used as the basis of some sort of flag. The second logo can be found at http://www.nutcracker.co.uk/images/60x60/soccer60x60/hull_city.jpg. This logo also uses a shield format, but it is far less complex. The upper portion of the shield is likewise black, but contains the words 'HULL CITY AFC' in white block letters without full stops after each letter in 'AFC', as well as no image of the bridge. The lower portion of the shield is a paler shade of orange, and features a tiger's head proper in 3/4 profile facing left. Traversing the bottom of the shield about 3/4 of the length down is a ribbon in black with the words 'THE TIGERS' in white block letters on the central fold of the ribbon. A variant of this shield can be found at http://www.4football.net/hull/crest.gif. In this version the background color of the lower part of the shield is a yellowish orange, and the ribbon at the bottom is similarly colored, with black borders. The words 'THE TIGERS' are written in white block lettering on the central fold of the ribbon. The version you see most of the time currently, on replica kit and so on, is the second. However, the point is moot, since the KC Stadium does not have a flagpole (it's quite new as well), so no flag. There is an informal flag used by supporters of Ipswich Town FC, which consists of a white rectangle on which the club crest, as depicted at http://www.krysstal.com/club_ipswich.html is centered. There are also several club rugs produced by various manufacturers which resemble a vertical flag with the club crest centered on a field which looks suspiciously like RAF blue, some of which have additional lettering at the top and/or bottom of the rectangle. No flag known. The club logo consists of a heraldic shield quartered alternatively red and blue with a white cross dividing the shield; each quartering has a heraldic emblem in it - a wheat sheaf, but aside from what appears to be a Scottish Thistle in the lower right I can't make out the details otherwise. It would appear that whoever designed the logo spent too much time in the Dominican Republic. Above the shield is a straw hat of the type commonly known as a 'Boater', having originally become popular during the Oxford-Cambridge Boat Race during the early years of the 19th Century. This hat, together with the team nickname 'THE HATTERS', refer to Luton's history as the center of the English hat-making industry, from before the Industrial Revolution until quite recent times, when men ceased wearing hats on a daily basis. The crest of the club has a number of disparate elements; the background color is either a light or an olive green, with a yellow bordure surrounding a canary in its eponymous color perched on a twig. One claw of the bird obtrudes upon what could either be a clock face (it has the 9 o'clock position marked) or the sun; in any event this is also canary yellow. In the upper left of the shield are a stylized representation of the Norwich city walls, which date from medieval times, and an English lion in its common medieval presentation. Both the wall and the lion are likewise in canary yellow, with the wall above the Lion. I am reliably informed that there is an unofficial flag which is rectangular, with a light green background, and with the elements of the crest in the center minus the bordure. The team logo is available at http://www.krysstal.com/club_forest.html; it consists of a stylized tree underneath which are three wavy lines, supposedly representing the River Trent, and the word 'Forest' in an artistic upper/lower case script. The logo is in red on a white background, and the unofficial club flag is the same except that it is centered on a white rectangle. Plymouth Argyle FC, in the South West of England, does not seem to have a flag. Their logo is quite simple but effective - a full-rigged sailing ship in white on a black or dark grey shield. I have been unable to find an actual flag for the Portsmouth Football Club. However, a complete achievement of arms for the club can be found on the web site of the Portsmouth Association of Disabled Supporters, which can be found at http://uk.geocities.com/padsforpompey. Pompey is the nickname for the city of Portsmouth. The central shield of the arms, namely the gold crescent and star on a dark or olive green field, is generally used as the club symbol. Preston North End FC uses an informal flag consisting of the club crest centered on a bright blue rectangle, with the words 'Preston North End FC' written in white block letters beneath the crest. The text appears in various sizes and in three rows, with the bottom row in smaller size lettering. The symbology of the crest is overtly Christian, in that it consists of a Lamb lying with a Cross slung over its shoulder. Several English football clubs use Christian symbology in their heraldry, but I have never been able to discover the reasons for this. The symbolism of the flag is definitely Christian; it is based on the lamb of St Wilfrid (AD 634-709), patron saint of the city of Preston. Legend has it that St Wilfrid founded a religious house on land at Preston (possibly Tulketh). The etymology of the city name is that it started as 慞riest抯 town�, shortening to Preston in later years. There has never been a lion on the flag, nor on any crest of the town or city of Preston. The 慺ull moon� referred to is simply a halo. The halo is usually associated with saints and other holy people. The colour of the halo varies between silver and gold. The cross is slung over the right shoulder of the lamb (the lamb of St John the Baptist) Thus it can be seen that the Christian symbolism employed in the flag and crest of Preston and Preston North End can be traced directly back to the founding father of the city. The details of the crest can be found here (a wall plaque from Preston). The website http://myweb.tiscali.co.uk/prestonian/preston.htm has the following explanation and photographs: The "PP" in the coat of arms is said by locals to stand for Proud Preston or Preston - Priest's town, this may be because of the historic association of the church and town and certainly in the coat of arms or seal it was originally a standing lamb with banner flag - the emblem of St. Wilfrid. When the parish church changed its name to St. John in Tudor times, the pragmatic townsmen sat the lamb down and it became the emblem of St. John the Baptist. It was the wrong St. John, but they probably thought it would be standing up again soon! With regard to the 'PP' in the coat of arms it is also said it may stand for Princeps Pacis, Prince of Peace or Preston-Preston. In 1376 there were no Ps in the town seal; in 1402 there were three Ps arranged decoratively on either side and below the standing lamb. In later times one of the Ps was lost and the other two ended up below the seated lamb. Reading FC seems to have two informal flags, both using logos on a plain field and either red or white backgrounds. The logo however is very interesting, and is semi-heraldic in design. It can be seen at http://www.itpartnerships.co.uk/events.htm. The logo is in the form of a seal similar to the American municipal seals and consists of a circular format divided into an outer and an inner ring. The logo itself has an external border of crimson and an internal one of black fimbriated gold. The background color of the outer ring is white, and at the top are the words 'READING FOOTBALL CLUB' in blue block lettering; at the bottom of the outer ring are the words 'EST. 1871' similarly written. The central image is quartered as follows; first, per fess argent and azure three and two; second; gules with a black lion passant facing dexter; third, likewise gules but containing a black crown: and fourth, per fess argent three and two. In the center of this image is an old-fashioned football in brown seamed black and with a white border. The Rotherham United FC logo exists in two forms, both listed on sites which appear to be equally definitive. At http://www.krysstal.com/club_rotherham.html the logo consists of a red shield with what looks like four sails of a windmill with a small red dot in the center, resting on a football. An alternative version, with a completely redrawn football and a black dot in the center of the windmill, and the edges of whose sails are likewise in black, can be found at http://www.nutcracker.co.uk/animatedgifs8.html. In both cases the logo is shown on a white background, and I should not be surprised if Rotherham supporters did not wave an informal flag or two, but as to which design is definitive is open to question. Sheffield Wednesday FC is one of two of the football clubs in that city. Sheffield Wednesday are known as 'The Owls', and the owl features prominently on their logo. The club flag is essentially the club logo on a blue rectangle. However, this flag is not to be found on the club web site. The flag can be found at http://www.h2obuildingservices.co.uk/images/casestudies/owls_logo.gif. Southampton FC, otherwise known as the Saints, do not seem to have an actual flag, but there is a logo which is vaguely heraldic in its composition. I have been reliably informed by several acquaintances that even if there is no actual club flag in a formal sense, the supporters of most sides simply take the crest or logo and affix it to the center of a rectangular piece of cloth, usually in the team colors. The Southampton flag, therefore, would consist of perhaps eight or ten vertical red and white stripes with the club logo somewhere on it. If it were in the fly it might possibly be mistaken for a US Coast Guard ensign, but I would guess that the logo is in the center of the rectangle. Any such flag, however, is, I stress purely an informal arrangement on the part of supporters and is not necessarily approved by the club itself, and this is true of most club crests, seals, or logos as well. The Southampton logo can be found at http://www.krysstal.com/club-southampton.html. Sunderland FC (officially Sunderland AFC, the 'A' standing for 'Association' - Association Football being the original name of the sport and referring to the rules formulated by the Football Association) has a heraldic coat of arms which can be found at http://www.weephillie.co.uk/newbadge.gif. The badge shown at this site has apparently recently been redrawn. There are several versions of Sunderland flags, which seem to follow two basic patterns or designs. Both patterns feature the coat of arms on a plain field rather than an actual Banner of Arms. Background colors vary from white to black, gray, russet, and others. Some flags, particularly those which use the plain white background, are simply on a plain field. However, other flags (including some white ones) have the words 'STADIUM OF LIGHT' underneath the arms. This refers to the new state of the art grounds of the club. This slogan appears in gold, white, black, red, and green, any of which can appear on any colored background. These words can appear either in the form of a horizontal line directly underneath the arms, or in the form of an arc. The motto of Sunderland AFC is 'Consecratio Excellentia' ('Consecrated to Excellence'). The Tranmere supporters flag consists of the heraldic arms of the club, which are dark blue on a white background, extended to form a LOB on a white rectangle. I have attempted to trace the origins of these arms, which I believe are based on either the former Birkenhead arms or on those of the Egerton family, who were leading landowners in the area, but I have thus far been unsuccessful. The person with whom I spoke in the Rovers Press Office did not know their origin. The England version of the Tranmere supporters' flag can be found at http://www.krysstal.com/club_tranmere.html. There are at least three unofficial flags for the Hammers. All feature versions of the club crest as depicted at http://www.krysstal.com/club_westham.html. The first version is violet, with the team crest and motto as depicted, including the light blue bordering. The second version is simply a logo on a plain field, also violet, with the central heraldic elements of the crest and the scroll but without the light blue bordure setting it off; in other words, the crest is not differentiated from the flag itself. The third flag is a vertical bicolor, violet-gold-violet, with the club crest (including light blue bordure) in the center of the gold stripe. I understand that after the Hammers secured the victory in the playoffs which returned them to the Premiership, a number of yet more 'informal' informal flags appeared, using the basic design of V-G-V and the crest with light blue bordure, but with various texts in violet or light blue featuring the words 'Back Home Again!' or 'Back in the Premiership' in various arrangements both above and below the logo. 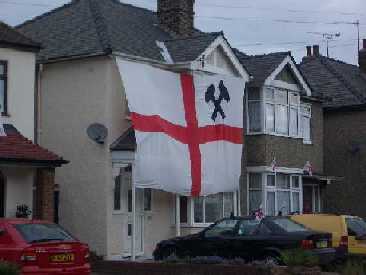 Another very large supporters flag was spotted by Jan Mertens draped on a house in London. It consists of the St. Georges cross flag of England with simple crossed black hammers in the upper hoist. In my opinion, this is almost certainly a football flag, as the car parked in front of the house is bearing two of the now very common St. George's car flag variants, this time with the three lions crest of the Football Association (and the England national football team) superimposed upon them. As Dean pointed out, West Ham (in east London) are known as the hammers. Such displays have become increasingly common in recent years during international football tournaments and no doubt will once again be prevalent during World Cup Germany 2006.
http://www.ukexpert.co.uk/photopost/data/597/4whu1_5300026.jpg (upper left corner shows the thin hammers on the St. George's cross). Wigan Athletic seems to be one of the few top flight English football clubs which does not have even an informal flag or flags. Several versions of the club logo, which is also heraldic in form, are extant; although none is cited as being official, I would guess that the version which appears on the club's own web site would be as close to that as one would get: http://www.wiganlatics.premiumtv.co.uk. Many Wigan Athletic car flags are now flown - they are blue with the club coat of arms in the middle (coat of arms can be seen on my website at the foot of http://myweb.tiscali.co.uk/ultimatewigan/Badge.htm - the black and gold coat of arms, not the red one).